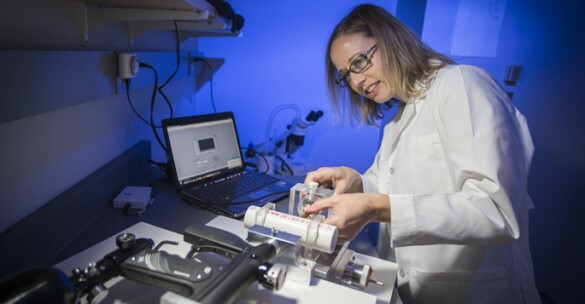 Tonia Rex, Ph.D., and colleagues at the Vanderbilt Eye Institute are working to uncover how best to treat ocular trauma, the fourth leading cause of blindness worldwide. It is a growing concern for the Department of Defense, which recently approved Rex for a $1.5 million grant to further study the impact that pressurized airwave blasts have on the eye. The three-year grant, “Neuroprotective Strategies for the Treatment of Blast-Induced Optic Neuropathy” is making way for discoveries that can lead to treatments for vision loss due to trauma. “The Department of Defense has such a great interest in my work because most of our wounded warriors were injured from blasts,” said Rex, associate professor of Ophthalmology and Visual Sciences. “We hear about it on the news all the time: improvised explosive devices, or IEDs, being used as the preferred mode of injury by various terrorist groups. It’s not just service members, but civilians are also being injured by these blasts. Patients with ocular trauma can have damage to the optic nerve and retina, said Rex. The optic nerve is made up of fibers that form a connection between the eye and the brain that is essential for communication. If it is damaged or not functioning properly, then the information that the eye collects of the visual world cannot be conveyed to the brain. In an effort to figure out the eye’s response to blast injuries and to assist with developing treatments for optic neuropathy, Rex worked with engineers to recreate an over-pressurized airwave. Investigators simulated the forced air from cannons and IEDs using a paint ball gun equipped with a regulator. On this scaled-down model, the airwave’s form and pressure peak are comparable to the blasts from explosive devices, she explained. In this case, Rex is not exploring the entire explosion, rather modeling the pressure waves that come from the explosive device and hit the eye. She said the pressure, or wave of air, is the first thing that impacts the body and causes damage. One of the questions she wants answered: Can the air wave itself cause damage to the eye without concomitant damage to the head or body? “We were able to assess vision as well as molecular and cellular level changes to the retina and optic nerve over a course of time,” she said. “We now have a pretty good idea of what events may be contributing to the vision loss. We are seeing some similarities with clinical reports and traumatic brain injury studies that make us think that this model is really clinically relevant. “We will now take advantage of what we learned and target the pathways that we think are contributing to the delayed vision loss in order to hopefully preserve vision after trauma. Anything we learn may be directly applicable to blunt trauma as well,” Rex said.